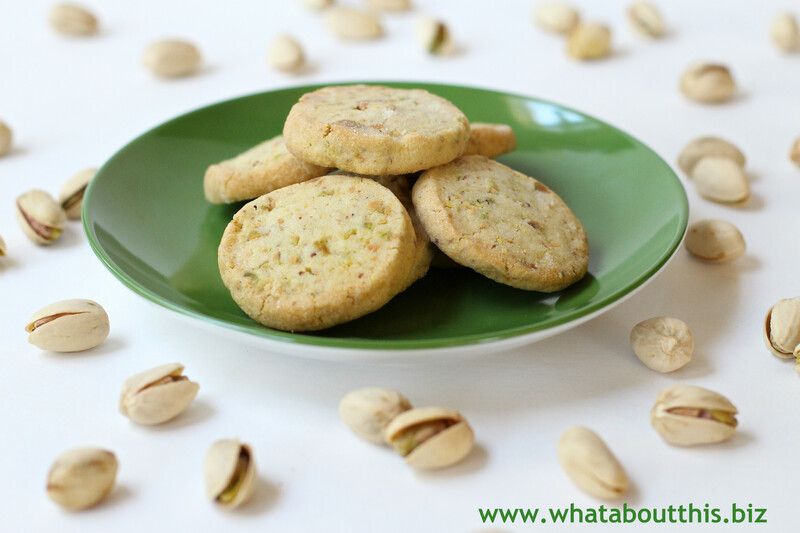 Pistachio Shortbread Cookies | What about this? A package of pistachio shortbread cookies sits in a basket near a cash register in a New Mexico restaurant. I debate whether or not to buy them. On the con side of the debate, eating cookies goes against my desire to lose weight and they seem a bit pricey at three small cookies for $3.99. However, on the pro side, I am on vacation and only a crazy person attempts to diet while traveling. Plus, my hubby and I need something to munch on during a long drive back to our hotel. Dilemma solved. I buy the cookies and eat them in the car, but that only creates a new dilemma. Because the cookies possess an exquisitely buttery taste and a wonderfully crunchy texture, I crave for more. Back at home, I search for an easy pistachio shortbread cookie recipe that will satisfy my cravings. Found it. Another dilemma solved. That is, until my next trip and my next craving! 1. Mix flour, powdered sugar, and salt together in a food processor. 2. Add butter, pistachios, egg yolk, and vanilla. 3. Pulse the mixture until a moist ball forms. Transfer dough to work surface. Divide dough in half. 4. Form each dough half into 8 x 1¼-inch log (if dough is too soft, chill until firm, about 30 minutes). 5. Wrap logs in plastic; refrigerate until firm, about 4 hours. DO AHEAD: Can be made 5 days ahead; keep chilled. 6. Preheat oven to 325°F. 7. Slice logs into 1/4-inch-thick rounds, rolling log after every few slices to retain round shape. 8. Place rounds on ungreased baking sheets, spacing 1-inch apart. Bake shortbread until barely golden, about 18 minutes. 9. Cool shortbread on baking sheets. 10. DO AHEAD: Shortbread can be made up to 4 days ahead. Store shortbread in airtight container at room temperature. 1. I rough chopped the nuts before adding them to the food processor. If you desire larger chunks of nuts in these cookies, you could add whole nuts to the processor. However, keep in mind that chunkier nuts might make it more difficult to slice the dough. 2. I lined the cookie sheets with parchment paper. 3. I chilled the dough logs for 2 hours and they were firm, but easy to slice. 5. Before serving I decided to dust them with Baker’s sugar (ultrafine granular) for a sweet and pretty finish. 6. I only got 44 cookies from this recipe.